What goes well with a million dollar cottage tucked away by the Red River in Winnipeg? An accessible in-ground pool and a brand new pool house and change room donated by community partners! Lead partner, Bockstael Construction offered to build the pool house as a team building project. All of their staff donated their time and Bockstael worked with their subcontractors to contribute to the project as well. “We know St.Amant really well and this was a fantastic opportunity to rally our team and the contractors we work with to do something beneficial for an organization that contributes so much to our community,” said John Bockstael, President & CEO of Bockstael Construction. The pool house, which looks more like a mini cottage, needed an area for a bath stretcher and change room, shelter from the sun and insects as well as a proper lift for people who use wheelchairs to get in and out of the pool safely. These additions make the area safe and accessible to more people supported by St.Amant. In addition to the pool house, Manitoba Liquor and Lotteries also supported the installation of deck-side bathroom facilities. 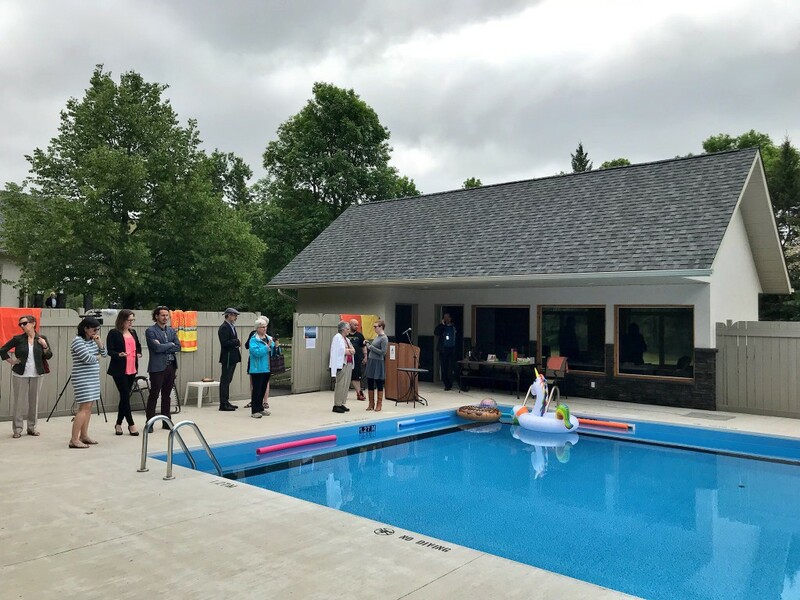 “Being able to get away as a family to this cottage and swim in the pool and host our kid’s birthday parties here, just means so much to us,” said Roy Otaki, whose children have received services from St.Amant.